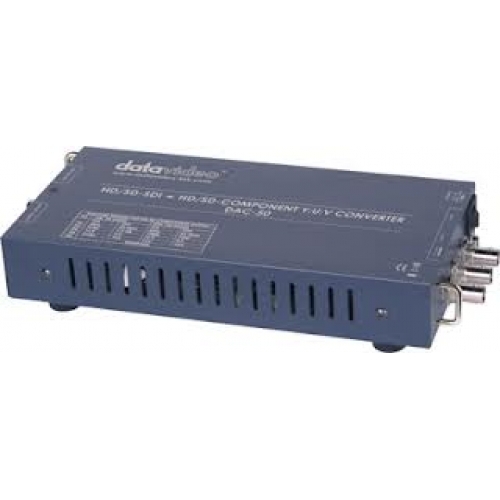 Datavideo’s DAC-50 is a HD/SD-SDI to Y:U:V Component & Composite Video signal converter with built in up/down scaling. 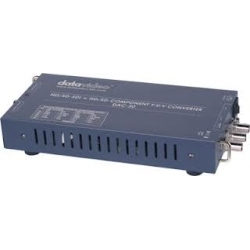 The built in scaler allows users to convert from a HD-SDI (1080i & 720p) or SD-SDI signals to HD (1080i & 720p) or SD (480i/50i) Y:U:V Component or Composite Video signal. The DAC-50 can also cross convert from 1080i to 720p. Cross convert from 1080i to 720p. Convert a HD-SDI (1080i / 720p) or SD-SDI signal to a HD (1080i / 720p) or SD (480i 50i) Y:U:V Component or Composite signal.